Summary: Duolingo is a great mobile learning application that teaches you the basics of several languages. While it is far from comprehensive and doesn’t go too deep, it excels at getting people to study a little bit every day. 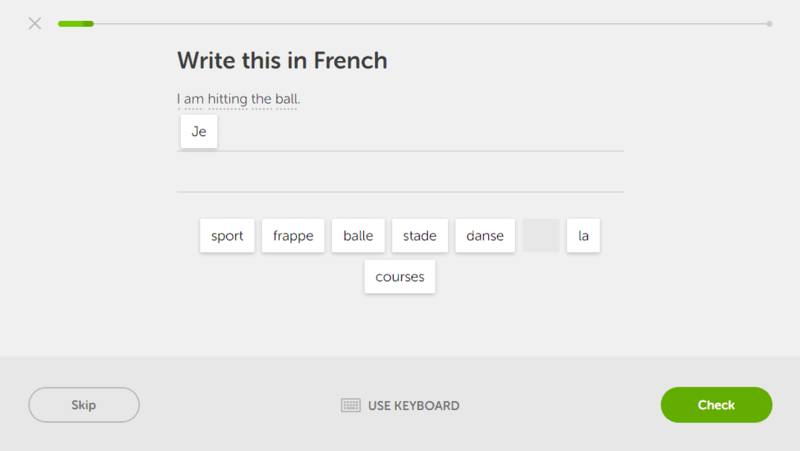 Duolingo makes learning French fun, easy, and free. It takes a while to get used to the teaching methods, but otherwise the quality and design are great. Duolingo is made for people who just want to learn the basics of the language without going in too deep. It touches the surface of almost all the topics. This resource is completely free and accessible to everyone. You could, however, learn French faster with other resources. The incentive system keeps you motivated and coming back day after day. Price: All the content available in Duolingo is free. If you want, you can pay to remove the advertisements and get a chance to download offline lessons. You can do this at $9.99 a month for one month, $7.99 a month for 6 months or $6.99 a month for 12 months. Other than that, there are only some in-app purchases that might make your learning more fun, but nothing pertaining to the actual educational content, save 2 or 3 bonus lessons. Rocket French and FrenchPod101 both have a plethora of good content for learning French. You could also find an online tutor from italki for less than $10/hour. 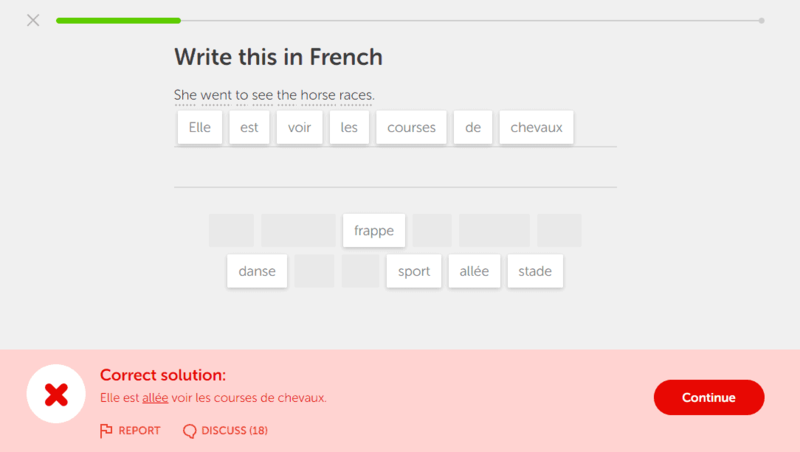 Duolingo was the very first resource that I used to learn French. The interface has been designed better than most other language resources out there which makes learning even more interactive and fun. The app especially stood out. Duolingo is ideal for people who like to learn languages as a hobby. After using Duolingo, you should have a basic understanding of French and be able to have basic conversations. With Duolingo, there are tons of languages you can choose from and each language is structured in a very simple way. This is what makes learning in Duolingo easy. Every language is divided into several skills, which can be anywhere from around 50 to 80, or even more. The French course has 80 skills that you can to choose from. These skills are then grouped into various checkpoints. You can choose to jump to a checkpoint if you feel you know those skills properly. These skills are then further divided into lessons. Depending on the topic, each of them will contain at least two lessons or as many as ten. A new addition to Duolingo is the inclusion of levels for individual skills. So, once you complete all the lessons in that given skill, you can move on to the next level which comes with harder questions and even more lessons. Each of the lessons is further divided into several questions. Again, depending on the difficulty of the skill or the things that you are going to be learning in the lesson, the number of questions can vary from 5 to 20. In short, you need to complete all the questions for a lesson, then complete all the lessons in a skill and complete all the skills to complete the course and win a nice shiny bird trophy at the end. Just to be clear, you don’t need to complete all the levels of a skill to move on to the next one. Another useful addition is the inclusion of their very own flashcards called “tiny cards”. These flashcards are unique to every skill and follow a similar structure. There are a group of flashcard lessons for every skill. These lessons teach you about the different words in it and build your vocabulary. Complete all the questions in a lesson and complete all the flashcards groups to complete that particular skill. Don’t worry, there are no levels to this aspect of the resource and fortunately, how you complete these flashcards doesn’t affect your main progress. It is simply a tool that has been put in to help you learn. When you go to their homepage, you will see there is an option to get started. You can easily switch between languages whenever you want. Thus, as soon as you get started, you will be asked which language you want to learn – the obvious choice being French if you are reading this review. Once you get done with that, you will be asked to select a daily goal. This comes in 4 general options – Beginner, Regular, Serious and Insane. The fact that Duolingo considers 20 minutes of studying per day to be insane gives some insight into the target user – very casual learners who might otherwise give up on the language. They require you to earn 10XP, 20XP, 30XP, and 50XP a day respectively. The times given in the screenshot are just an estimate of how long it will take you to earn that much. Typically, you get 10 XP after you complete every lesson in a skill or if you complete any practice. Then you are finally asked to create a profile. You can easily do this either via a google email or by connecting to Facebook instead. Both are super simple and let you connect with your friends who might be learning with you. You can choose to set a profile then with your picture and other stuff or skip this part for later. If you want, you can skip the entire registering for some time. Moving on to the last step, you are asked whether you know some French or you know absolutely nothing. If you do select the former, you will have to give a test that checks how much you know and if you should be allowed to skip the first few lessons or skills. You should be able to skip the first 3 skills if you get all or most of the questions right. If you don’t you might get to skip just a few of the lessons. Once you are done with this, or if you choose the latter option, you can finally get started on with the lessons. Let’s check them out in depth. The structure of every lesson is rather simple. As mentioned before, you will have several skills to go through and each of these skills have multiple lessons. Every lesson has certain notes that go along with it. Unfortunately, these notes aren’t as detailed as the ones you’ll get at Frenchpod101 or Rocket French. However, they can give you a brief idea before starting the lesson since every lesson is essentially a quiz with unlimited attempts. For whatever reason, these notes aren’t accessible through the app. Every time you do not understand a word, you can choose to hover over it (or click it) and you will instantly understand what it means. However, in my experience, in certain exercises, you’ll see that due to the vast number of synonyms possible, you don’t always have the right word mentioned when you select the word. This proves to be quite problematic sometimes since the synonyms can often change the entire meaning of the sentence depending on how they’re used. Now, every lesson will have a set number of questions depending on the content covered or the difficulty of the lesson. These questions come primarily in 4 types: Writing, Speaking, Listening and Reading. The great part about Duolingo is that you can opt out of any of the listening or speaking exercises if you aren’t in a position where you can do those easily. If, for example, you’re studying in a quiet classroom, you don’t want to be yelling things into your phone or loudly play a foreign language. So, if you are in such a situation, you can select options such as “I can’t speak/hear right now” and those types of lessons will be resumed after an hour. Alternatively, you can permanently switch them on or off in the settings menu. For the speaking exercises, you have to basically listen first and repeat using your microphone. It checks how much of it you got wrong, and if it’s only a word (or two in case of long phrases), you are allowed to pass that question. Like any other speaking lesson, this one also isn’t perfect. For those looking to improve their spoken French, I’d suggest trying out Speechling. For free, you can get lots of practice recording sentences and comparing your recordings to a native speaker, along with a bunch of other useful features. Then, if you’re willing to pay for a subscription, you can have an unlimited number of recordings checked for pronunciation mistakes. Listening lessons are basically translating what you hear into French (or English) and typing it in French. Duolingo has a feature that identifies if you make a typographical error and still accepts the correct answer. This is great since your finger might have actually slipped. However, it may also be a problem because you might have been wrong. Fortunately, it states that you made a typo and shows you the correct answer as well. Another flaw that I spotted was that it allows you to pass a question even if you do not get the accents right. Thus, you might end up learning the whole French language without learning the accents and this is important because sometimes the accents change the meaning completely. Moreover, the website provides a virtual keyboard for you to use whereas your mobile has the option to use those accents. This is one place where Duolingo can stand to improve. The reading and writing section is basically translating what has been written. This comes in various types, such as, match the following, fill in the blanks or arrange the words. Simply answer all the questions, and you will be able to level up for every individual skill and access tougher words to learn. Once you complete the lesson, you can choose to go over to the tiny cards section to study flashcards. It helps you review the words that you might have forgotten. I suggest doing this for quite some time after you finish the lesson and have moved on, so it stays fresh. For every lesson you complete, you get 10XP. But, if you can make it through the lesson without any slip-ups you get 5 XP as a bonus. As mentioned before, you also have the option to skip to a certain checkpoint and skip certain lessons. To do this, you must give a test where you do not get any help from the computer. You have only 3 lives and about 20 questions to answers. If you get 4 questions wrong, you cannot jump to that checkpoint. So, all you need to do is complete all the skills in order, step by step and inch your way closer to the golden trophy bird. Now, there are some questions, where you might feel that you were right, but still, Duolingo claimed you were wrong, leaving you very confused. At such times, going over to the discussion or comments of that question is very important as experts keep commenting on that issue there and people might help you out and resolve your query. Moreover, you get notified every time someone comments, so you know what’s going on. Duolingo offers all its content for free to its users. In return, it shows some ads to the users discreetly on the website (or in a very irritating fashion on the mobile app). You can choose to remove these advertisements and gain access to downloading offline lessons. You can do this at a minimum of $6.99 a month for a year’s subscription or a maximum of $9.99 a month for just a single a month’s subscription. A 6-month subscription comes at $7.99 a month. In my experience, it takes only around 3 – 4 months to complete the course if you practice every day and go well above the daily limit. The way the courses are structured, that is quite easy. If there is one thing that sets Duolingo apart from the other language resources, then it is the extra features that get you competitive and keeps you coming back every day for more. Duolingo lets you compete with your friends. Remember how you created a profile using your Facebook or Google accounts? You can find your friends through this and then start following them and compete to be on the top of the leaderboard. Your position is determined solely based on the amount of XP you have accumulated that week, that month or since the profile was created. There is no bonus for this, but it is always fun to challenge your friends. Their new feature includes something called clubs which is created by people learning the same language as you. Once you join a club, you can compete in weekly competitions and then win certain prizes. There are also mini quizzes that happen every day for you to test your knowledge. Moreover, you can comment and ask your peers any question that you might have. You could even create a club of your own. This section of Duolingo is more like a challenge system. It sets certain challenges for you to complete. Some of these include winning weekly club competitions, finishing the course or earning 2000 XP in a day. Until all these challenges are completed, our minds simply cannot rest at ease. Duolingo measures how many days you have been continuously using the app and completing the daily goal. Streaks are necessary to complete certain achievements and earn lingots every 10th day. Every time you complete a level for a skill, you get one crown. Each lesson has about 2-4 levels. If you complete all the levels and get all the crowns for that skill, then you get what is known as a golden skill. Often while learning a new language, you forget to revise the older words and thus tend to have a rather weak command over the language. Duolingo keeps a check about how long ago you completed a skill and accordingly asks you to keep your “strength” up. All these extra features along with a few other small ones are what makes Duolingo an immersive experience. What it lacks in content depth, it makes up in providing the external motivation factor that all the other resources lack. There are several things about Duolingo that makes me and tens of millions of other users like it. These tiny features that keep you coming back day after day are Duolingo’s biggest asset. There are several French resources like Frenchpod101 or Rocket French that are much more comprehensive and would give you a better foundation, but they cost money. Moreover, when it comes to the sheer experience of using the resource and having fun, nothing beats Duolingo. The mobile app isn’t as resourceful as the website; however, it has been designed much better than other resources for learning French. Ultimately, Duolingo excels at getting people to keep coming back and studying a little bit every day.